When I first tried to run a command in Windows Vista I expected to find the majority of features in the same place where they were in the Windows XP operating system. It made sense in my opinion as it would allow users who upgraded their XP system to Vista to find their way around without having to spend time exploring the operating system. When I clicked on the Windows Vista start button for the first time I was a little bit puzzled to find a search in the place of the run command. Sure, I still had the option to use the Windows-R keyboard shortcut to open the run box but I did somehow miss the run box in the start menu. I found out, after a bit of digging, that there is a way to add the run box back to the start menu of the Vista operating system. Let me explain to you how you too can add it back if you want it to appear there. The search is not that bad and will often display the commands that you want to run there as well. When you enter cmd for instance you will see the command prompt in the results, but it does take a click to open it. It can also take time before the search returns results and using the run box is definitely the faster option. This adds the run box back to the start menu so that you can run commands from it right away without having to use the search first. 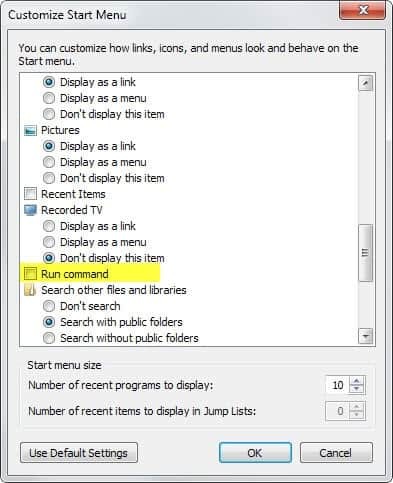 Update: Note that you can access the same setting in Windows 7 to bring back the run command on this version of Windows as well. No. I didn’t enjoy it. But it was useful. Why the heck did Microsoft get rid of this essential tool from the Start Menu by default? Dumb decision.